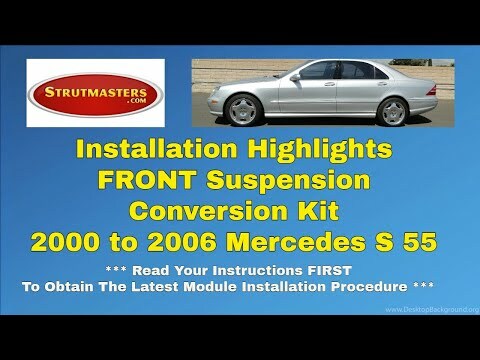 Strutmasters 2000-2006 Mercedes Benz S55 4 Wheel Air or Hydraulic Suspension To Coil Spring Conversion System is the perfect solution to your active suspension problems. Designed to be very affordable, you can convert your ENTIRE factory suspension set up to use our custom tuned struts and coil springs for less than the price of replacing just ONE Original Equipment strut at the dealer. 2000-2006 Mercedes Benz S55 4 Wheel Air Or Hydraulic Suspension Conversion Kit (MS14F) is the perfect solution to your air suspension problems. Designed to be very affordable, you can convert your air suspension to use standard. There is a wide array of parts that make up the faulty air suspension system on your 2000-2006 Mercedes S55 RWD sedan. When any part of the assortment breaks, the whole suspension system is defunct. This can get very expensive to repair. We created a suspension conversion kit that eliminates the need for each expensive part to work in sync. This kit includes four completely pre-assembled coil-over struts that are installed with four bolts per strut. Installation is simple- no modifications are required before putting it on. We designed the kit to be more affordable and reliable than the original parts. In fact, we back it up with our lifetime limited warranty. Each kit comes with easy to read installation instructions, complete with pictures and helpful support information. Our experts show you exactly how to perform an installation in the videos on our YouTube channel. And if that hasn√¢¬Ä¬ôt convinced you, call our in-house technicians who are always happy to answer any bad suspension repair questions you might have. Also, read the reviews on our site from our satisfied customers who are happy they made the switch to non air suspension. 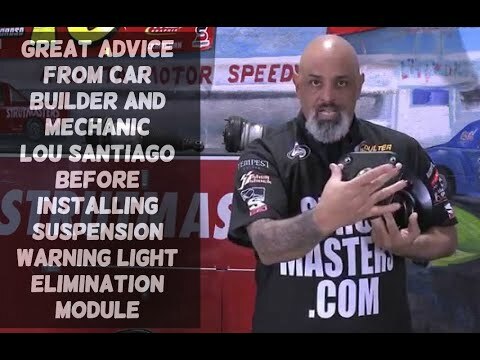 How Do I know If My S55 Air Suspension is failing? There are commonly seen signs of a failed or leaking air suspension system that you want to look for on your 2000-2006 Mercedes S55 RWD sedan. It‚Äôs important to know what they are so you can diagnose your air suspension while it is still going bad before total failure has set in. The most noticeable is a sudden uneven height difference between different sides of the sedan. Sagging in the rear end with the front end remaining inflated is common to see. Some drivers describe this as looking like the S55 is squatting down too low to the ground or worse, like it has been slammed down to the ground. Perhaps there is only a slight lean from one side to the other. Either way, if you think your S55 is not meeting and maintaining its appropriate ride height then the air suspension may be going bad. Confirm this by looking for an illuminated suspension warning message or light on the instrument cluster. And lastly, listen to the air compressor to see if it has stopped working or is running too often (will be very loud and noisy). If any of these issues present themselves in your S55 then you will want it fixed immediately. + Air/Hydraulic Strut Assemblies ($1,070/strut) ) + Air Compressor Assembly ($450) Or + Hydraulic Pump ($1,510) = TOTAL: Over $5,000 (and that doesn√¢¬Ä¬ôt even include replacing electronic components that are known to fail such as the height sensors). + Strut Assemblies ($590/strut) + Air Compressor Assembly ($400) Or + Hydraulic Pump ($1,080) = TOTAL: Over $3,400 (and that still doesn‚Äôt include replacing electronic components that are known to fail such as the height sensors). 2000-2006 Mercedes S55 (RWD Sedan) Air Springs (x4)- (models with air suspension only). Commonly referred to as air bags, a plastic and rubber bag that is fitted on top of the strut that uses pressurized air as a cushion instead of a metal coil spring to hold a vehicle off of the ground and off of its wheels. These are the number one cause of all air suspension leaks. All air springs all go bad at about the same rate. If one is leaking, the others will not be far behind. For a proper repair, all of them need to be replaced at the same time. 2000-2006 Mercedes S55 (RWD Sedan) Struts (x4)- a type of shock absorber; has metal tubing filled with gas-charged hydraulic fluid that is connected to the wheel of a vehicle in order to reduce the effects of vertical travel on a rough surface which controls the bounciness, and therefore comfort, of a vehicle. ; the air spring assembled on top of the strut is commonly referred to as an air strut. 2000-2006 Mercedes S55 (RWD Sedan) Height Sensors (x4)- a linkage located near each wheel of a vehicle with any electronic suspension that, either mechanically or electronically, constantly measures the height of the vehicle, and reports this information back to the control module so that the computer can identify if changes in height need to be adjusted accordingly. The ride height sensor is a moving part, and like all moving parts, they will eventually wear out. 2000-2006 Mercedes S55 (RWD Sedan) Air/Hydraulic Lines- tubes that run from a compressor to the air struts (or a hydraulic pump to the hydraulic struts for models with hydraulic active suspension), which carry pressurized air to the air bags (or hydraulic fluid to hydraulic struts) in order to adjust the height of the vehicle, respectively. 2000-2006 Mercedes S55 (RWD Sedan) Solenoids (x4)- usually L-shaped, these plastic components connect the electrical connection and lines of suspension components to the suspension control module on vehicles with active suspension. The solenoid regulates the air pressure for each air spring. Solenoids start to leak as they wear out causing the vehicle to sag or to lean. This will cause the ride height sensor to send a signal to activate the compressor in an attempt to inflate the air suspension and level out the vehicle. This excessive work load will eventually lead to total failure of the compressor. 2000-2006 Mercedes S55 (RWD Sedan) Compressor Assembly- (models with air suspension only). Creates/sends pressurized to active suspension components. When the air suspension starts leaking, the compressor/pump starts working harder to try to keep the system inflated. By the time air suspension leaks down completely, sitting the vehicle on its tires, the compressor will either have failed or be well on its way to full failure. Buying replacement struts and taking the time to install them only to find out the compressor still needs to be replaced can be very frustrating, time-consuming, and expensive. 2000-2006 Mercedes S55 (RWD Sedan) Hydraulic Pump- if your Mercedes has hydraulic suspension instead of air suspension, then the hydraulic steering pump will also serve as the reservoir for the hydraulic fluid going into the struts. 2000-2006 Mercedes S55 (RWD Sedan) Suspension Control Module- a computer which is responsible for the operations of the air suspension system and maintaining the vehicle√¢¬Ä¬ôs correct ride height. 2000-2006 Mercedes S55 (RWD Sedan) O-rings- Although they are the least expensive parts of the air suspension, they are responsible for maintaining the seal where all of the air lines connect. Be sure to replace the O-rings when repairing any air suspension system. Hi Angelo. I made the conversion and it was a success. The car rides well and the customer is very happy. I am so pleased you guys do such a good job and I’m looking forward to doing more business with you. Thanks for the great work. Awesome shipping. I switch to non air struts because of the noise my pump was making. Jason at Strurmasters is the man,helped me out more then once and for half the price of going to the dealer and even have the switches to cut the message out. I converted my 2000 MB S500, I am very pleased with the ride a little stiffer but with not more air problems it’s great. I only have one problem after about 30 miles of driving my dash light says air ride is bad, it resets when engine is shut off. I recently purchased Struts and Shocks for my S500 and I must admit that’s the best decision I’ve made in years when it comes to fixing cars! I also needed advice w/the installation and when I spoke to the staff at StrutMasters I literally got a step by step lesson which I totally needed but was afraid to ask for!!! This experience has me looking for cars with busted air suspensions just so I can convert and make a BIG PROFIT!!!!! I am so pleased I learned of strutmasters conversion kit. My car was sitting on the ground. It would have cost in excess of $6000 to repair. I fix with just over $2100, including labor. I still have the smooth ride and the security of never having to experience of the late night car failure. I did the Strutmasters coil over conversion on my ABC equipped 2001 S500. I’m very happy with the results and the ride is back to normal. 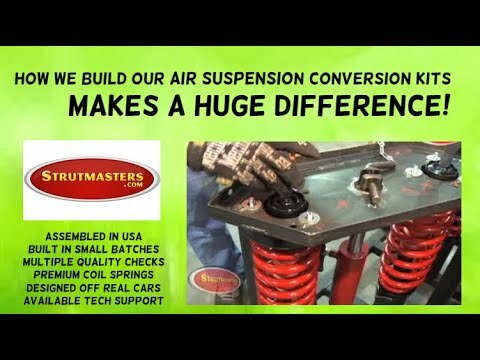 I bought my car with an inactive ABC system and rather than pour thousands of dollars on an unreliable system, I decided to go with the Strutmasters conversion. Installation was overall very easy and straightforward however the only problem I ran into was that the front “quick disconnect” connections were frozen and not so quick to disconnect. After speaking with a Strutmasters tech, I was able to remove the entire line and plug from the valve. I was able to install the rear struts by myself even though they suggest 2 people. I just inserted the strut up into the strut tower and then I used my extra jack to support the strut while I tightened the 3 nuts on top of the strut inside the car. I drove the car around for a while to let things settle and then had my car aligned. This can all be done by the DIY’er in 1 afternoon.